Greenwich native Steven Duque pumps gas at the Old Greenwich BP on the corner of East Putnam Avenue and Sound Beach Avenue March 1, 2012. HARTFORD -- Majority Democrats and minority Republicans on Monday tried to get out in front of the battle against higher gasoline prices. But the leader of the state's gasoline retailers said a proposed cap on Connecticut's gross receipts tax would have little effect at the pump. Senate President Pro Tempore Donald E. Williams Jr. and Speaker of the House Christopher G. Donovan announced plans to institute emergency legislation to freeze the 7.1 percent gross receipts tax on wholesale gasoline sales at current levels for one year. Williams, D-Brooklyn, and Donovan, D-Meriden, said that the 15 percent hike in gas prices since January also prompted them to propose fines of up to $10,000 for price gouging and to give state Attorney General George Jepsen additional power to pursue civil investigations. "There can be severe penalties and sanctions," Williams told reporters. "People are predicting that the price of gasoline may go to $5 a gallon this summer. Let's all hope that it's not the case." Donovan said that projections he has reviewed indicate that there could be $8 million to $10 million less per month in gross receipts tax revenue that would translate to consumer savings at the pump. If the wholesale price were to rise to $3.50, consumers would then save about 3.5 cents per gallon under the proposal. If the wholesale price were to climb to $4 a gallon, consumers would save about 7 cents. But Michael J. Fox, executive director of the Gasoline & Automotive Dealers of America Inc., said the proposal right now would have negligible benefit for consumers, who pay among the highest gas prices in the nation. Under the proposal, the state's gross receipts tax would be capped once the wholesale gas price hit $3. It is slightly more than $3 now. "The cap that everyone is proposing is totally useless," said Fox, who represents about 1,260 gas retailers, in a phone interview. "The gross receipts tax needs to be changed from a percentage to a fixed price per gallon," he said. Fox criticized the way the gross receipts tax has been managed. Connecticut drivers Monday afternoon said they would be pleased with any relief they could get. Vincent Zak, 49, spent $75 filling up his 2002 GMC Yukon XL at the Food Bag on Hope Street in Stamford. Zak said he limits his driving to about 20 miles a week, walking his children to school and buying groceries just down the street. "There is a reason to tax the residents of the state, but I think gas taxes are pretty steep," Zak said. "We just keep getting hit every summer with prices going higher and higher." 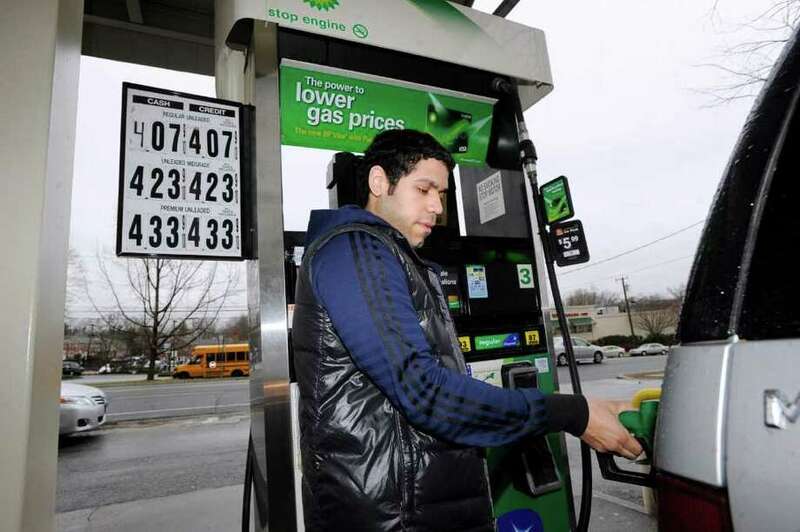 The average price of a gallon of regular gas in the Bridgeport-Stamford area has risen to $4.08, 14 cents higher than a month ago, according to the AAA Fuel Gauge Report. Jeanne Shaner, 41, of Danbury, said she would be happy about the tax cap as long as legislators did not create some type of repercussion that would hit her pocketbook harder. "Whenever they make something good, usually they give you something worse," she said. "If it's all going to be good, then that would be great." Republicans, noting that they have offered to freeze the gross receipts tax and other tactics as many as eight times since 2006, said they were politically vindicated by the Democrats' announcement. "You have to admire a person who admits they're wrong and has the courage to change their mind," said House Minority Leader Lawrence F. Cafero Jr., R-Norwalk, after the Democrats' announcement. "And it is with great admiration that I say thank you to the Senate Democratic leadership." Cafero recalled that earlier this year, when GOP lawmakers warned of escalating prices, Democrats discounted their remarks as politically motivated. "But fortunately, I think they have realized that people out there are angry and frustrated and are looking for government to do something," Cafero said. "So it's a great day to hear that our majority leaders, our colleagues, are willing to cap the gas tax and move forward with this plan." Republicans said they could get together in the House and Senate to vote on gas pump relief as early as Tuesday in attempt to address one of the highest gasoline prices in the nation. Democrats said the timetable would be closer to weeks than days. "The people of the state of Connecticut, who had the highest tax increase in state history foisted on them last year, are facing the highest gasoline taxes in the nation," said Senate Minority Leader John McKinney. "In Massachusetts, they pay 23 cents on a gasoline tax and in Connecticut it's close to 50 cents." Andrew Doba, spokesman for Gov. Dannel P. Malloy, said Monday that Malloy is interested in the legislation. "The governor supports the concept and we look forward to details of the bill," Doba said.